This powerful documentary examines the lives of former street children now living at the Good Samaritan Children’s Home, an orphanage and school in the sprawling Mathare slum of Nairobi, Kenya. 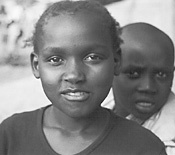 These children, many orphaned by HIV/AIDS, slipped through the fraying net of Kenyan family structures and social services and ended up on the streets of Nairobi. They sniffed glue, scoured trash bins for food, and slept under cars until they were brought to the Home. The film depicts the lives of several of these children as they go to school, struggle with the poverty, disease, and violence that surround them, and reflect on their present and former lives. “Orphans of Mathare” demonstrates that the grim reality of Mathare is not only medical in nature, but social and cultural as well. The HIV/AIDS epidemic threatens to create a generation of children without parents or homes, growing up to be drug addicts and thugs, alienated from their traditional family structure, their culture, and their history. The film is not simply about a medical epidemic; it is about an entire culture in crisis. Although it focuses on one orphanage in Mathare, the film lays bare the complicated relationship between poverty, violence, disease, Christianity, tradition, and the orphan crisis in Kenya and throughout sub-Saharan Africa. “Orphans of Mathare” will provoke thought and discussion in an array of courses in African studies, development studies, Third-World studies, and cultural anthropology. It was produced by Randy Bell and Pacho Velez.